Always looking for someone to help or a mystery to solve, they will do whatever it takes to help out their friends, and whilst it may involve a bit of trial and error, by working together they always manage to save the day. 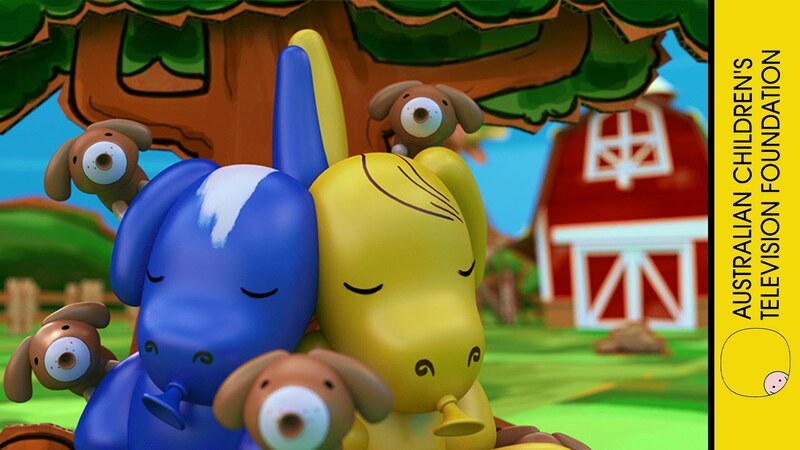 A colourful and entertaining animated series for two to four-year-olds, narrated by eight-year-old, Patrick, and nine-year-old, Cleo, Balloon Barnyard will delight and engage young viewers. Streak is trying to become a detective. He is investigating the missing hay from the top of the haystack. The sheep are moving to a new pen today, but the sheep dog is sick. So, Pip and Streak decide they’ll herd the sheep. The donkeys have finished building a cubbyhouse from the barn’s spare planks. It’s time for a cubbyhouse party! Streak and Pip are just saying hello, when a mischievous Tuck jumps out and scares them, causing Streak to get hiccups. Streak brings a basket of apples for breakfast, and Pip has found something under a tree. They don’t know what it is. Pip has some ideas - is it a flower, a blanket, some food? Hmm - it isn’t like any of those things. They need to find out what it is! All the corn in the cornfields is being eaten by crows - Pip and Streak have to do something! Pip and Streak are dancing together outside the barn. It’s the day of the barn dance and they want to be ready. They step and twirl around the barn. The donkeys are having a lazy afternoon, asleep under a tree. The narrator checks if they have anything to do. Pip can’t think of anything, Streak can’t think of anything. The narrator checks again, and because they’re prompted, they remember it’s Cud’s birthday — they haven’t got anything ready. Pip and Streak are pulling a cart full of Halloween decorations up to the barn. There are pumpkins and white sheets and broomsticks sticking out the top of the cart. It’s Halloween at Balloon Barnyard, and the donkeys are throwing a Halloween party - with all kinds of fun games and scary dress-up costumes.